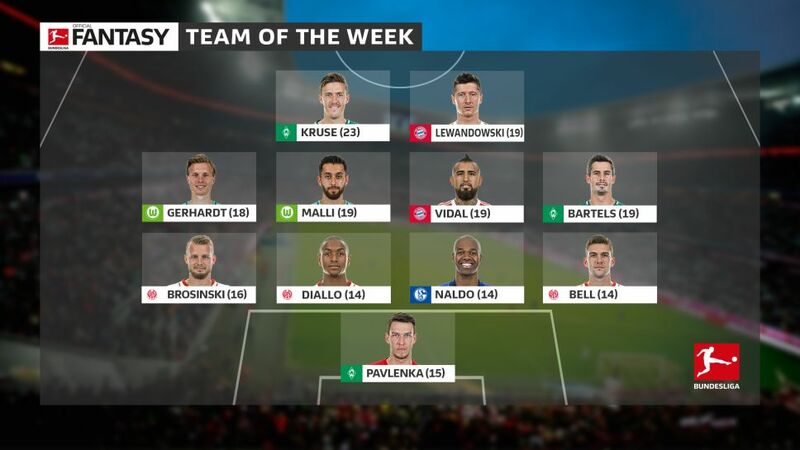 The Bundesliga's leading scorer, Bayern Munich's Robert Lewandowski, partners Werder Bremen's hat-trick hero Max Kruse in attack for Matchday 12's Team of the Week. Those of you lucky enough to have a crystal ball in your possession will be cackling with glee at the whopping 190-point haul the Matchday 12 Team of the Week chalked up over the weekend. Robert Lewandowski and Arturo Vidal starred for Bayern Munich in their victory over fellow Bavarians Augsburg, Max Kruse and Fin Bartels combined multiple times for Werder Bremen’s first win of the season, and there was a fruitful defensive showing from Mainz in the Carnival clash with Cologne. Here’s this week’s team in all its glory! It may come as a surprise to hear that the best goalkeeper so far in Official fantasy Bundesliga with 82 points has only just notched up his first win of the season, but the Werder custodian just keeps racking up those points. Seven saves against Hannover and a clean sheet rounded off a perfect day for Pavlenka as Florian Kohfeldt’s side collected their first three points of this campaign. The Mainz captain likewise kept a clean sheet in the 05ers' 1-0 win at home to fellow Carnival club Cologne. He had a busy afternoon against muscular strikers Jhon Cordoba and Sehrou Guirassy, but more than held his own, winning a colossal 16 duels to rack up 14 fantasy points. Now a regular in the Bundesliga Team of the Week, the 34-year-old centre-back looks to be maturing like a fine wine. Winning a monumental 20 challenges against Hamburg – including 12 of his 13 against teenager Jann-Fiete Arp – the Brazilian was a nuisance in attack as well as defence as the Royal Blues climbed up to the heavy heights of second place for the first time in exactly five years. The France U-21 captain is the second Mainz representative in this defensive line-up. Much like his club captain, the 21-year-old also put in a monster performance against Cologne’s physical forwards, even winning more duels than Bell for just Mainz’s second clean sheet of the season. The third and final cog in this Mainz-dominated defence is left-back Brosinski. Naturally not as robust as the central defenders alongside him, he still played his part in the clean sheet, but stole the headlines with his match-winning penalty against his former club to hoover up even more Fantasy points. It was a case of “to me, to you” between Bartels and striker Kruse as the dynamic duo took apart the Hannover defence with a string of assists and goals for each other. It was the 30-year-old who put Bremen on the way to their first victory of the season thanks to Kruse’s through-ball, before Bartels returned the favour (twice!) for Kruse to seal a hat-trick and the Green-Whites’ first three points of the campaign. Recently challenged by his coach Jupp Heynckes to show signs of improvement, Vidal gave the perfect response with a match-winning performance against Augsburg. Notching up his 25th Bundesliga goal, the Chilean opened the scoring for the sixth time as a Bayern player, and the champions have never lost when that’s happened. That trend continued as minutes later, the midfield all-rounder turned provider as he stole the ball on the halfway line before sliding in Lewandowski to double the lead before half-time. A warrior’s response from “El Guerrero”. There was Turkish Delight at the Volkswagen Arena thanks to Turkey international Malli, whose brace finally secured the Wolves both a first win at home this season and a first set of three points under Martin Schmidt following seven consecutive draws since succeeding Andries Jonker. Malli also added grit to his headline-stealing performance with 14 challenges won – the most on the pitch – to add some extra gloss to his points tally and feature in the Team of the Week for the second consecutive Matchday. The UEFA U-21 European Championship winner from the summer opened his goalscoring account for Wolfsburg in just the third minute of his 36th Bundesliga game for the club against Freiburg to set the Wolves free and on their way to that first win under coach Schmidt. Also putting in a robust performance with 12 challenges won, the 23-year-old turned provider late on to set up Malli’s second and secure those vital three points. A quick bit of research before this Matchday will have told you that Lewandowski was a must for any Fantasy team this weekend. With 16 goals in 12 Bundesliga appearances against Augsburg ahead of this fixture, the inevitable happened once again and the league’s top scorer went and bagged himself another two against his favourite opposition. That’s now 18 in 13 against the Fuggerstädter and 13 in 12 league games this season. Points galore. Matchday 12’s Man of the Matchday with a second-half hat-trick against Hannover, plus an assist for the opener from Bartels – it was an all-round perfect performance from the Werder striker as they secured their first win of this Bundesliga campaign. Despite being without a goal this season, Kruse and partner-in-crime Bartels tore through what had been the league’s third-best defence up until that point. Picking up more points than anyone else this weekend, it was a monumental Matchday for Max.